Ready to attract new customers, build trust and drive action? The right digital content, when promoted properly, draws visitors to your website, nurtures them into customers and keeps them engaged after a sale. But you need quality content and a winning strategy to drive these efforts. That’s where we come in. The digital content we craft – from fun infographics to in-depth whitepapers – is written to resonate with your audience, designed in-house, promoted across multiple channels and tied into your sales team. 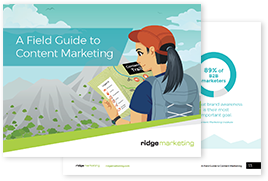 This fun eBook will set you on the path to compelling content, proper promotion and lead scoring as you guide your prospects to a sale. Prospects often do extensive online research before they’ll make a purchase or speak with a sales rep. Content marketing helps you create a trusting relationship with your audience while alerting sales when to take action. “Ridge Marketing has been our virtual marketing team for many years. From developing campaign strategies to getting deliverables out the door, they’ve been a valuable resource and really took time to understand our industry."